Compare credit cards from MBNA and check out one of the largest roster of cards in the country. You’re in good company with MBNA Canada. MBNA, now a division of the Toronto-Dominion Bank, is one of the country’s leading providers for both co-branded and affinity credit card programs. Its association with hundreds of Canadian organizations, credit unions, financial institutions, sports associations, educational institutions, and charities make this brand a top choice for credit card shoppers — especially if you like credit cards with specialized perks and affiliations. Take a look at the other benefits you get when you choose MBNA. With more than 50 credit cards offerings, MBNA gives you a lot of options. And we’re not just talking about rewards and no-fee options (although MBNA has both). We’re also talking about its extensive affinity partnerships, which let you pick cards affiliated with the organizations you care about most. MBNA’s wide selection of co-branded credit cards means whether you’re an alumni at one of its partner universities or you love Harley-Davidson motorcycles, MBNA’s got a card for you. And you’ve got a lot of opportunities to earn cool perks or contribute to great causes — you could apply for one of MBNA’s speciality cards and earn fan perks for your favourite team or you could sign up for one of MBNA’s alumni cards and give back to your alma mater. 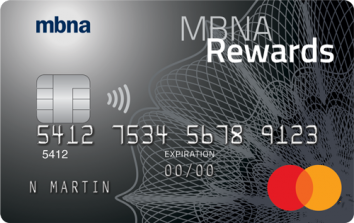 MBNA offers the flexibility of its very own rewards program. If you apply for the MBNA Rewards MasterCard or MBNA Rewards World Elite, you can use your card to collect points for flights, hotels, merchandise, gift certificates, travel discounts, cash, or even charitable donations. Lost your card? Concerned about suspicious activity? MBNA offers you peace of mind. If you’re an MBNA credit card holder, you’ll be able to connect with a live agent 24 hours a day, seven days a week. 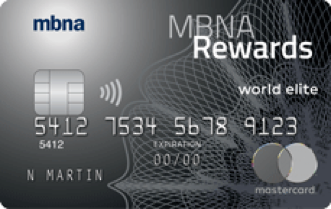 MBNA may offer a lot of choice, but its rewards cards, which let you earn points on everyday purchases, and its Platinum Plus card are the big fan favourites. Here’s why. If you love earning rewards but hate paying an annual fee, this is the card for you. The MBNA Rewards MasterCard lets you collect one MBNA Rewards point for every $1 you make in eligible purchases. These points are flexible — redeem them for cash back, travel, brand-name merchandise, gift cards, and even charitable donations. And if MBNA’s reward system isn’t enough, then how about a generous welcome bonus? MBNA gives you 5,000 bonus rewards points for signing up and making your first eligible purchase. That’s equivalent to $50 when redeemed for cash back or travel. Double your rewards. If your annual income is greater than $80,000, or your household income is greater than $150,000, you’re ready to start using this premium rewards card. It offers one of the best cash back rates in Canada — you earn two MBNA Rewards points for every $1 in eligible purchases — plus it won the MoneySense award for best cash-back credit card in 2016. And after you make your first eligible purchase, you’ll be gifted 10,000 bonus points as a thank you — worth $100 when redeemed for cash back. This card also comes with a lot of great additional benefits, including rental vehicle collision damage waivers, purchase protection, and travel benefits. Frequent use of this card will easily cover its $89 annual fee. MBNA, originally founded in the U.S. in 1982 as Maryland Bank, N.A, quickly grew to become the world’s largest independent credit card issuer, specializing in affinity cards. In 1997, MBNA expanded into Canada and became the country's single largest issuer of MasterCard credit cards. MBNA Canada was purchased in 2011 by TD Dominion Bank, giving TD a robust MasterCard portfolio to offer its customers.